‘Well that’s creepy’, I’m sure all moms have said. Creepy stuff happens around here. Kids are magnets for the creepiness. Or maybe you just notice more because you have small people to keep alive on a daily, non-stop basis. The following event has happened three times in a similar manner, with the location differing. The first time this happened we were up at the cabin by the lake. G was napping downstairs, my hubs was out doing something in the yard (in the rain) and S was watching a show in the loft. I was sitting in the living room under the loft reading my book and soaking up the peace and quiet. Suddenly I heard S talking upstairs. I thought he was commenting on his show, but it sounded like a conversation. He paused and then says ‘I’m going down to get a snack. I’ll be back’. When he gets down the stairs he says, ‘Mama?! How did you get down here so fast?’. I asked what he meant. He tells me he was just talking to me upstairs, but then I was down here. I tried to get him to describe what I looked like, but he just said it was me. He was completely confused by what happened and walked away shaking his little four-year-old head and completed his mission to find a snack. This same scenario with slightly different details has happened two more times at our house in the last six weeks or so. Pretty wild! We’ve always had slightly supernatural events at our home: hearing people call your name (it’s happened to me, our nanny and my mom. Neither of them knew about my experience before reporting it to me), unexplainable crashing noises, one time all the cabinets/drawers in the kitchen opened silently while we were all standing in there but happened to turn around at the same time, etc. But this is the first one that occurred elsewhere and involved the kids. Creepy, right?! And that’s why I don’t need to watch scary movies… I might have my own developing around here. I’ll keep you posted. Alaska is huge. Like, super huge. We have lots of fires burning all summer, every summer and usually the plan is to let them burn. They are healthy for our forests: plant and animal life. Usually most are slow rollers, hanging out underground for a while, popping up to eat some trees… they are dangerous, but generally left alone to burn out. We also, in most of Alaska, are used to some pretty mild temperatures and weather. To have the temps climb into the 70’s is insane. A week worth of highs into the 80’s is unheard of. I can remember most of the times it has been in 80’s (in our area)because it is so rare. So you take people who aren’t used to the extreme dry we’ve had (lack of snow, hardly any rain), an attitude of ‘that won’t happen to me’, mixed in with what must be stupidity… and what do you get? A raging, uncontrolled fire in one of the few populated areas in our State. In 12 hours the fire has consumed over 6500 acres and destroyed 45 structures. It’s spreading towards more homes, cabins and lives. The area it is in has is a popular recreational area with hundreds of family cabins, dog mushers and families. Last night I watched my Facebook blow up with friends who are watering down their properties hoping to make a difference in the fate of their memories and dreams. Watching videos of the devastation unfolding… pictures of homes on fire, the highway consumed with flames on either side, firefighters trying to defend homes… and hoping this is the only night I’ll be glued to the computer for updates. My husband was stuck waiting for the highway to reopen so he could get up to work. The fire is surrounding the highway making travel, at times, impossible. When they started running pilot cars through the fire around 2am, he left to try and make it through. Hearing him report that it was ‘bad’ was a big deal as he’s usually very sound and calm about tough situations. What happens next? More homes will be lost. The communities are coming together to relocate people, pets, whatever belongings they can gather. Donations are being rounded up to help those displaced. Strangers driving from hours away to loan trailers, kennels, tents, etc. It’s amazing how so much stupidity can create so much destruction, but also love and kindness. Keep us in your prayers as this battle blazes on. Our cabin is about 35 miles from the north end of the fire… But my son says ‘today will be a good day’, so I’ll put some faith in that. I read this article today about allergies. And what we are really allergic to… maybe? These types of things sort of make my mind go ‘BOOM’ these days. I feel like this should have been on the news YEARS ago and people should shouting it in the streets (or at least telling people in a moderate voice in the store). *On that note… I had to restrain myself from telling a lady not to buy Eggos the other day. Jeez. I have thought for years that there is no way there has been such an increase in allergies to our food. How is that even possible? If anything our bodies should be adapting and getting more compliant with food types over the generations, not more sensitive. Obviously there is something more going on. Definition of allergy (just so we’re on the same page): a damaging immune response by the body to a substance, especially pollen, fur, a particular food, or dust, to which it has become hypersensitive. An Immune Response!?! What? I never really thought about what that meant… your body is interpreting a substance as a THREAT and is responding appropriately. Green peas? A threat? Apples?? A threat? What? And these aren’t genetic allergies… parents allergic to nothing have kiddos allergic to EVERYTHING! Is it a coincidence that the rise in allergies coincides with the GMO revolution of our food?? Interestingly enough the rise in cancer also coincides with this timeline… but that’s another thought process. Have to focus on one at a time. Gluten sensitivity?? Or allergy to glyphosate (Round Up) in your food? Wheat, soy and corn are the main crops sprayed with Round Up. It doesn’t kill those plants because they have the pesticide built into their DNA and are immune to it. Which means you are cannot rinse it off. Not only is it sprayed on the plant, but it is INSIDE the plant and is part of what makes it what it is. DNA. Scary. Who would want to put that in their body?? Nobody. Which is WHY these companies have put so much money into anti-labeling laws. Which is WHY we need all food containing GMOs to be clearly labelled. Watch this video and educate yourself. Nobody told me what was going on until I met this amazing lady on a plane last Fall. She opened my eyes to how big of an issue this was… and motivated me to find out what I was feeding my babies. And exposing my family to. This is a BIG DEAL!!!! Don’t live in the dark anymore! June isn’t going well so far. Woke up this morning at 5:45 because my sweet girl was calling for ‘help, help, help’ in her room. Turns out she needed more water. She had two water bottles, one full, one empty… but they both needed to be full. Duh, Mom. Popped back in bed and my son (who had snuck in there during the night) announces- ‘uh-oh. I went potty in your bed’. Luckily the only area damaged were his undies and jammies and ‘ankie’. He threw them all onto the floor for me to take care of later. Sweet. Finally time to get up for good. Super excited to wash my hair and brush my teeth after our cabin trip where I forgot my toothbrush and was too tired to shower last night. Go to open the door… and guess what?! My sweet boy locked the door last night and then closed it. Locked out. It’s a knob that takes a key, but we haven’t had it since we moved in. So- woke up early, potty in the bed, no shower before the kids get up and now I get to figure out how to pick a lock. Happy June. The good news is I got it done with the help of some Facebook friend advice (the internet is a saving grace sometimes!). Used a screwdriver and wiggled it until the lock clicked and let me turn it. Good to know! Still wasn’t time for a shower if I wanted to take on by myself… but there’s always tomorrow. PS I’m writing this at 10am. My lavender latte has perked up the day and my kids are now each playing nicely on their own in the living room. I’m sure our troubles o’ three all were taken care of early this morning and the rest of the day will be smooth sailing. That’s totally how it works, right? Jeez. It’s summer in Alaska!! Week three of my summer break and we’ve been checking things off our to-do list. 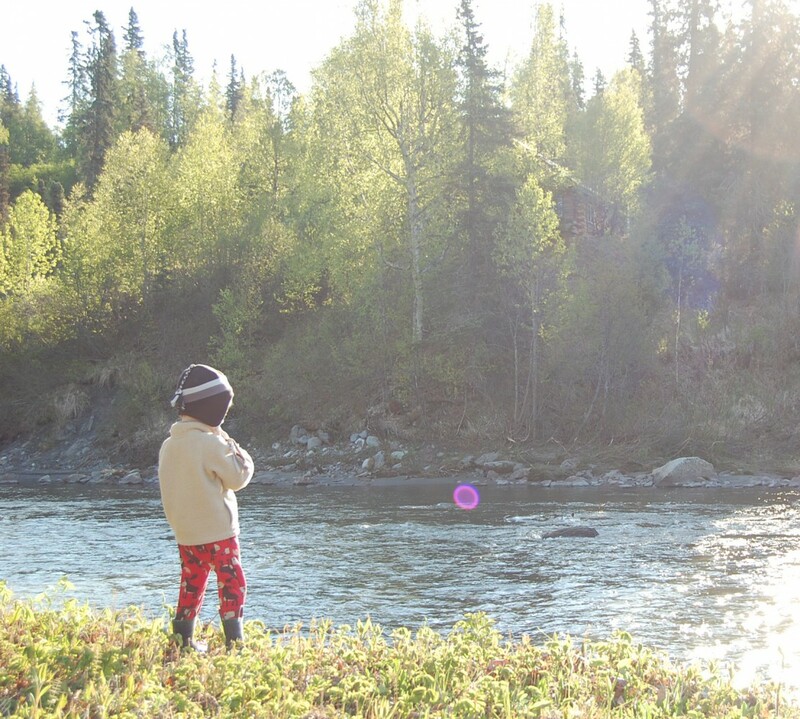 This weekend we enjoyed two days of 80^ weather (which is rare in the part of Alaska we live in) at the lake. We purchased a paddle board at the world’s second most dangerous store: Costco. I have put off trying it out because I knew I would fall hard for the sport. And… I was right. It’s AMAZING! There’s something so surreal and peaceful about walking on the water. Well… peaceful when you do it by yourself. I have two small people who are now proud addicts of ‘lake surfing’ with me. Also one other big kid: my hubby. 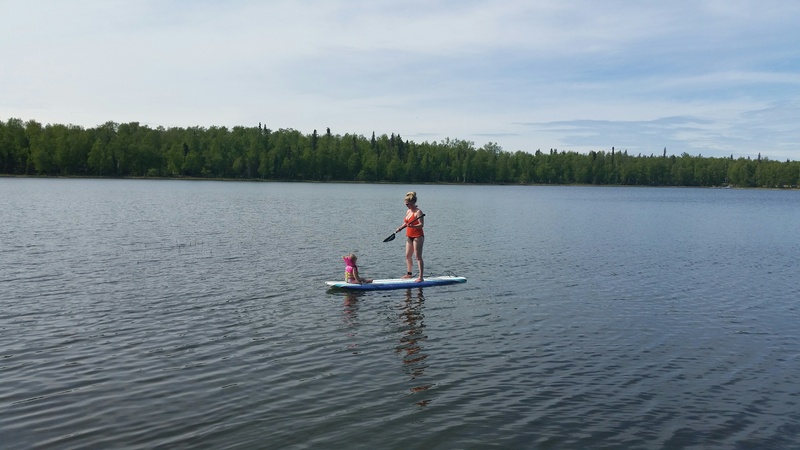 My son is so awesome- he sits on the front of the board while I paddle- today he stuck his feet of the edge and played in the water while looking for ‘lake monsters’. My daughter hasn’t gotten quite as confident as her older bro. She will sit very still and carefully, while she faces me and look for ducks and fish. Her main concern is how deep the water is, so we stay near the edge when she’s on board. She’s just two- so I can only imagine the adventures to come. I wouldn’t say she is braver than her big bubba, but she definitely is more adventurous. My husband would like me to hook our SUP to the jet ski and pull him on it. Yah… pretty much a motor addict… that man. Turns out our cabin neighbors also love to SUP and we got to check out their inflatable ones today. Next stop, Play It Again Sports to purchase two of those for our travels. I knew I should have never gotten on that board!! I am in love! Bottom line- if you haven’t tried it and would like an activity that allows you to enjoy nature in some peace ‘n quiet- this is a good one. Boards can be rented- but if you’re like me and know this is a match for you, just buy one. $370 at the Costco. Have fun!